Eat This Donut Now! Eat It! This post is going to be short and sweet. There is a donut that is king of all donuts. All other donuts bow down to this donut and pay homage. This donut lives in an unsuspecting little donut shop in Thousand Oaks. It is a magical land of donut-tty goodness. Fresh Donuts – In the Trader Joe’s shopping center at the corner of Arboles and Moorpark Rd. This place is not glamorous, it’s just a little shop on the corner next to PJ’s pub. And that is fine by me. I wasn’t even going to share this place with the general public, but the more I thought about it, the more apparent it became that I would be doing the world a disservice by keeping it to myself. The donut that I always buy is the chocolate old fashioned. This picture does not do it justice. The secret to its deliciousness is the fact that they glaze the donut first and then dip it in chocolate frosting. Not only that, but the chocolate frosting is a 1/4 of an inch thick in some places and somehow stays soft even if it has been sitting in the case all day. Of course, it’s best to get it while it’s fresh (around 10pm) but I could eat these things at any time of day. At Fresh Donuts they charge a little bit more for their donuts, but you end up saving money because you only need to buy one to get your fix. All of the donuts are great, even if none of them live up to the majesty of the chocolate old fashioned. They really need to start serving it with a syringe of insulin because I go into diabetic shock almost every time I eat one. Still, I keep going back for more. If chocolate isn’t your thing, I highly recommend their apple fritter. I can actually fill up on 1/2 of one (because it’s the size of a dinner plate) but it’s really hard to stop. It’s the baked good equivalent of crack. I know everyone raves about Stan’s Doughnuts but compared to Fresh Donuts they don’t stand a chance. Mikey got their Boston Cream donut and I hope he will comment on it at the end of the post. I’m sure it was amazing too. Anyway, that’s all I really wanted to say. 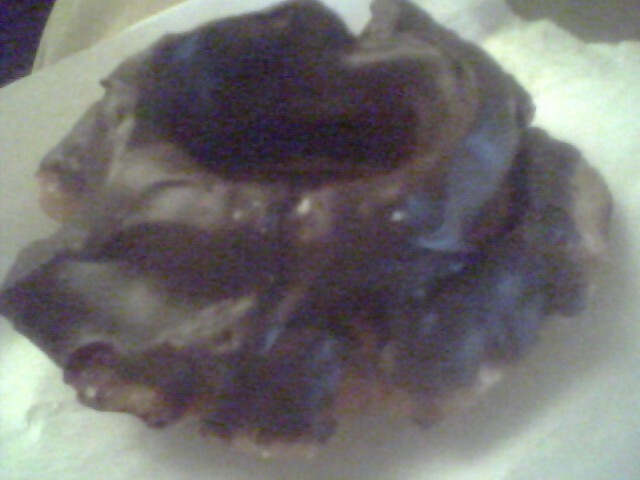 Chocolate old fashioned at Fresh Donuts = best donut ever. Eat it, love it, regret it later. Keep coming back for more hidden gems and our 100th post on Wednesday. Thanks again for the support of all of our readers. You guys are awesome! Mikey – I was going to make a comment but since I was in the editing room with this post and had chocolate frosting all over my face I thought I’d just add to B’s post. The Boston Cream is by far the best around here. My blood pressure immediately raced my blood sugar to see which could explode my heart first. Luckily, Jesus installed an extra donut frosting filter tank next to my liver to absorb the sweet sugary wonderfullness. You guys didn’t know fat guys have extra filters, so unlike you skinny people if Donuts ever took over the world you would have to look to all of us to save your skinny butts. Thanks for the donut B! someone needs an iphone to take good foodie pictures with ……..
but wait a few weeks til the new one comes out. playin with our emotions like that….takin bad pictures of perfectly good donuts……. I could have used a leica and it still would not have done it justice. I used to think these were vampire donuts that wouldn’t even show up on film. I guess I underestimated their stealth capabilities. Stealth vampire donuts?! I’m there! What I like about the place is that they’re open 24/7! I believe it’s run by an Asian family – the ladies in the morning/during the day and the fellas at night. Needless to say, the ladies are nicer while the fellas get stuck dealing with the drunks wandering around late at night. OMG – you’re kidding… they’re open 24/7??? I’ve lived here since 1982 and I never knew that! I’m an idiot. Unfortunately I go to that wonderful donut shop less frequently now than I used to (when ya get old ya gotta watch those sugary carbs – ) but I will agree… those old-fashioned donuts are HEAVEN. My hubby’s fav is the cinnamon roll, but I also love the apple fritter. And anything that’s filled – yummmm. My daughter is a purist… she loves regular raised-glazed, and the occasional chocolate iced.